ProMed Scanning from BizTech Healthcare Solutions, Inc.
Berkshire Health Systems is a private, not-for-profit organization serving western Massachusetts. With 350 beds, it is the region’s leading provider of comprehensive healthcare services, and serves the area through a number of affiliates. Like most HIM (health information management) departments, the Hospital experienced the challenge of streamlining its coding process. Typically, a coder would have to access patient records in a minimum of three separate systems to review the patient data necessary to code and abstract a record. For Berkshire Health Systems, that meant patient EMR data from Meditech, scanned records in Valco and utilizing 3M’s encoder. The ED coding process was especially complicated because the HIM staff was responsible for entering the majority of ED charges. Further, because of the system integration involved between Meditech and 3M, there were batch processes that ran on a daily, overnight schedule that extended the coding and billing cycle. BizTech Healthcare Solutions, Inc. was engaged to deliver its award-winning ProMed for Coding application integrated with Meditech, 3M, and Valco. ProMed for Coding uses .Net development to provide one user interface that delivers patient EMR data from Meditech and access to the scanned paper record. The 3M encoder is launched during the process when the charges are submitted to Meditech. Online forms have replaced the paper charge slips. The entire charge entry process is handled online during the ProMed coding session, enabling a “one-touch” environment for coders. 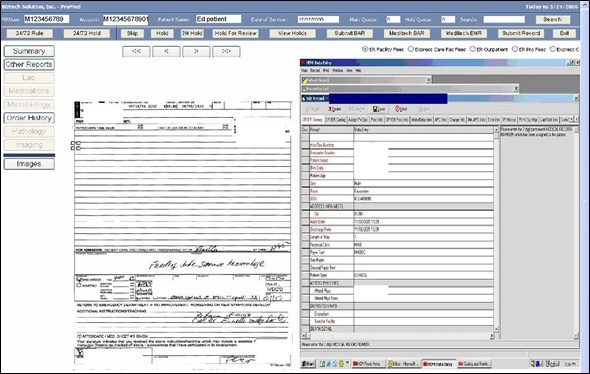 Scanned paper records are linked to the patient data and displayed in the image viewer that is embedded within ProMed. Once charges are submitted within ProMed, the charge data is immediately processed into Meditech BAR and 3M is launched. Instead of coders waiting until the charges flow from Meditech to 3M in the overnight batch process, they can immediately code and abstract within 3M. Since all patient data is linked within ProMed by patient account number, the coder never has to type in the 12-digit account number. This means ProMed increases data accuracy while also eliminating coder keystrokes. ProMed for Coding has improved the efficiency and productivity of the ED charge entry and coding process with its advanced data capture capability. The manual data entry of charges has been eliminated. Since all of the records are linked by account number and delivered to the coders’ desktop, a great deal of keystrokes has been eliminated. The records that are processed through ProMed are ready for billing one full day faster than previously achieved, which drives down the ‘Discharged but not Final Billed’ rate.